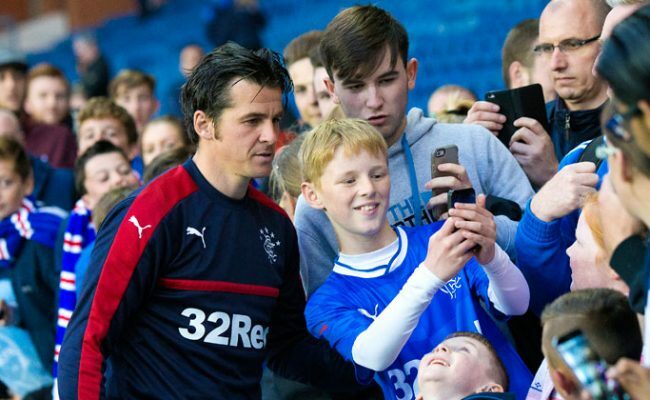 GOALS from Fraser Aird, Arnold Peralta and Dean Shiels gave Rangers a well-earned victory in their final home game of the 2013/14 season and kept the club’s unbeaten league record intact. On an emotional afternoon Aird’s stunning shot after 36 minutes flew past Stranraer’s keeper David Mitchell and it once again showed the undoubted potential the Murray Park youngster has. Arnold Peralta then scored his first goal of the season before the hour mark with an excellent finish before Dean Shiels made it 3-0 from close range finish after Mitchell had made a good initial save to deny the Ulsterman. With club legends Johnny Hubbard and Bobby Brown presenting Lee McCulloch with the League One trophy after the final whistle this was always going to be a day of celebration for fans. But prior to kick off the stadium went silent for exactly one minute as Sandy Jardine was honoured by all present. 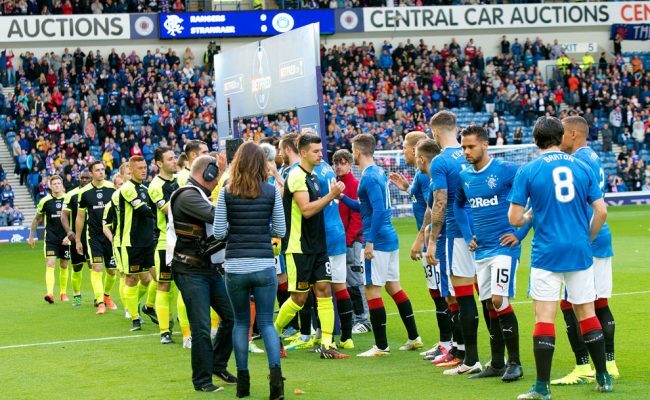 Players and officials surrounded the centre circle while staff at the club stood alongside Ally McCoist and the Gers bench with many shedding a tear for their former colleague. It was easy to forget there were 90 minutes of football still to play but the players in blue, all wearing Jardine’s number two on their shorts, regained their focus quickly as referee Stephen Finnie got the action underway. 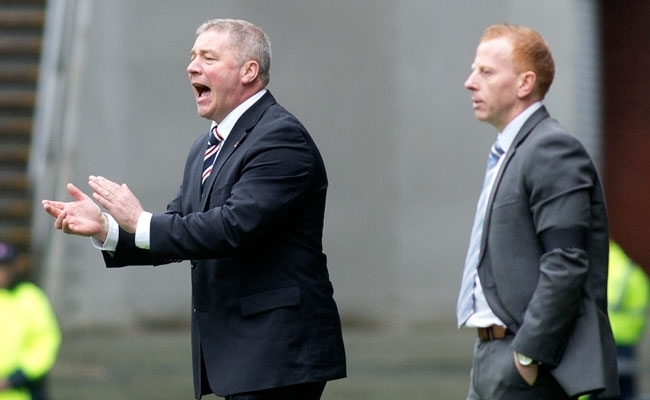 Ally McCoist and Kenny McDowall were rarely out of their technical area in the first half issuing instructions and it was clear the champions wanted to mark today’s occasion with a victory. Every fan in the stadium stood to applaud Jardine in the second minute before Stevie Smith’s cross was met by Jon Daly but his header was saved by Mitchell. On the right side of the pitch Peralta then slipped a pass through to Shiels but he sent a shot wide. The home side were certainly creating the better chances and on seven minutes a shot from Law flew over the bar after a clearance fell to the midfielder. On 20 minutes a near-post corner from Aird was then headed out to Law again and he lashed a curling left foot effort which didn’t have quite enough bend to find the opposite top corner of the visitor’s net. Daly hasn’t yet scored in April but on 24 minutes he came close to breaking the deadlock when his deflected shot went up and over Stranraer’s number one before clipping the crossbar and going out of play. Smith was again making lung-bursting runs up and down the pitch and with half an hour played he powered in a low cross but Peralta blasted a first-time effort high and wide from just inside the 18-yard box. If any team was going to open the scoring it was Rangers and it was Aird who bagged his seventh goal of the season on 36 minutes. Law played the ball out to his 19-year-old team-mate who cut inside his marker before smashing a terrific shot beyond Mitchell at his near post. 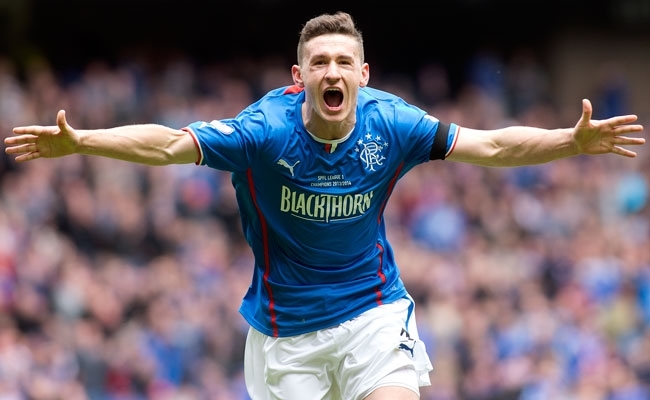 Once again it was a moment of quality from the Toronto-born starlet who also scored the only goal in Rangers’ final match of the 2012/13 season against Berwick here at Ibrox. At half time that goal was all that separated the teams but given the number of chances you felt more would come in the second period. Aird’s confidence is clearly sky high and five minutes into the second half he again cut in from the left flank and from 25 yards his low shot was straight at Mitchell who watched it all the way. Ian Black then delivered a deep free-kick into Stranraer’s box and Mohsni controlled it superbly on his chest but his half-volley was again straight at the Blues’ busy keeper. He, however, could do nothing as Arnold Peralta doubled his side’s advantage on 59 minutes. Aird played a good pass to the Honduran down the right channel and a trip by a defender allowed him to sprint through on goal. 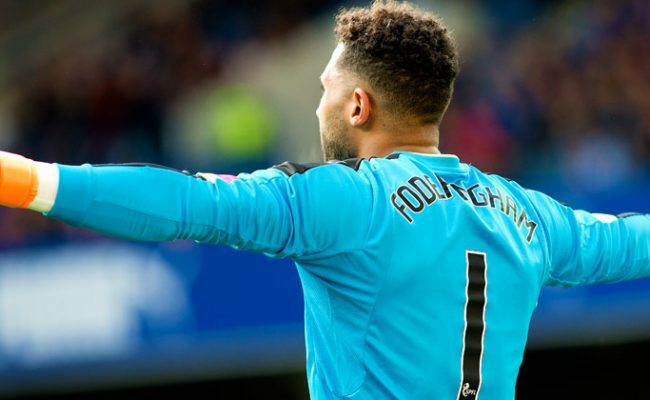 With just the keeper to beat he showed great composure to curl the ball low into the net before celebrating with jubilant fans in the Copland Stand. 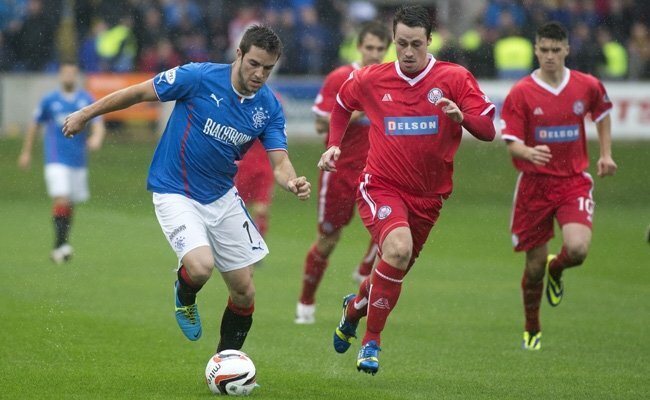 Rangers were now rampant and after Aird had narrowly missed with another thunderbolt from distance they made it 3-0. 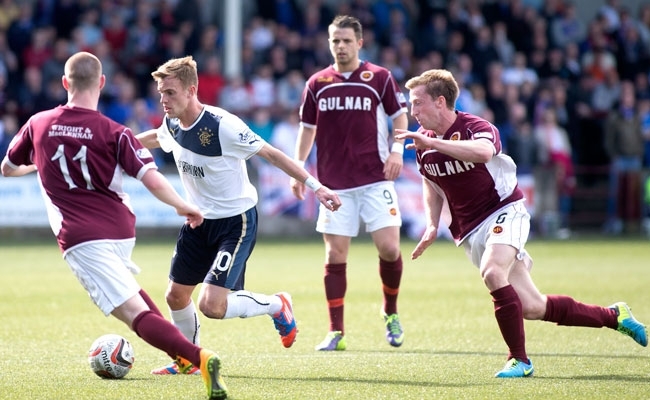 Smith’s cross was perfect for Shiels who saw his diving header saved. But as he was lying on the pitch the ball came back to him and he cushioned it into the empty net. Ally McCoist made changes to his team in the latter stages with Nicky Clark, Kyle Hutton and Emilson Cribari all getting run-outs. Hutton came closest to adding to the scoreline with a deflected shot that cannoned back off the post, but the scoring was finished. That said it was still an impressive performance for the champions who now go into next week’s final game of the season against Dunfermline at East End Park with a great opportunity to make history.